"I'm worried about an all-out war." The encounter: Tammy was the very first person I interviewed for this project. 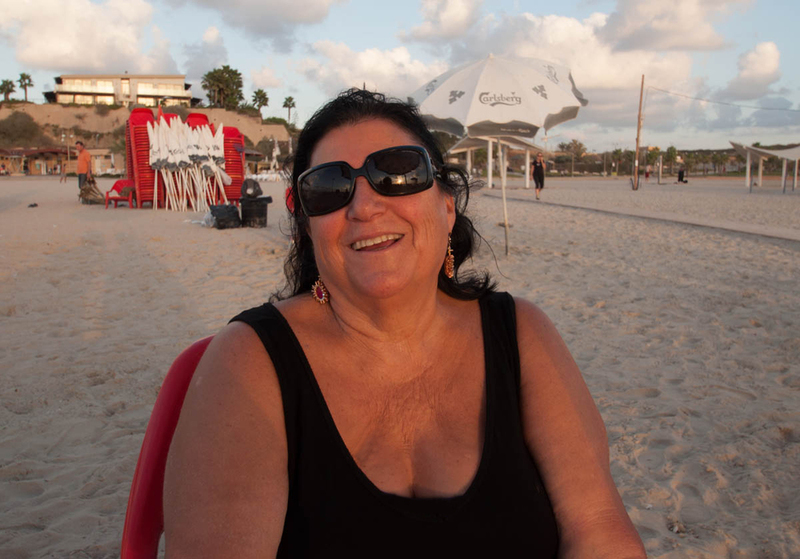 We had just arrived in Israel and were enjoying the beach after a busy day of errands. I was a bit shy approaching strangers and asking them about their lives. Tammy looked like the most approachable person on the beach. She was sitting by herself while her husband went for a swim. I want to catch a bit of Nirvana and watch the sunset. I'm supposed to be retired. But since we own a business, I keep working. Beside that, I enjoy doing handicrafts: doll-making, bead-work.. all kinds of art. That's for my soul. I'm very Jewish, but I'm not religious. I don't disrespect religion – not at all! – but I don’t practice it. I consider myself secular, or Reform Jewish. My sweet husband is over there, swimming... We have three sons and nine grandchildren, two of whom are now in the army. I'm first-generation Israeli. Although I look Moroccan, both my parents immigrated here from Poland. My mother came in 1933 and my father arrived a year later. I feel a very strong connection with this land; my roots are deep, deep in the ground here.